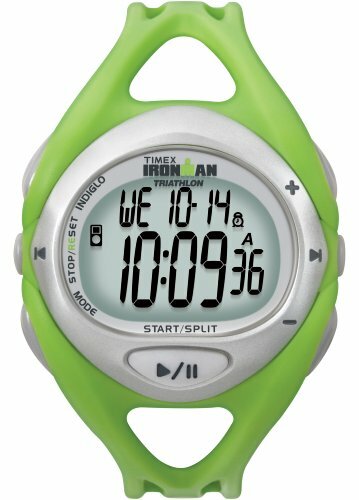 The unisex Timex Midsize Green Ironman Sleek iControl Watch transmits signals seamlessly to your ipod. Simply connect the included receiver into your iPod and you can control your music in a heartbeat. Designed to work with your body and coordinate with your iPod or with your iPhone (in airplane mode), the iControl watch is sleek and comfortable to wear. This watch is compatible with iPod 5th generation (video); iPod Nano 2nd generation (aluminum) 2GB, 4GB, and 8GB; iPod 5th generation (video) 60GB and 80GB; iPod Nano 1st generation 1GB, 2GB, 4GB; and the iphone. By using the buttons surrounding the dial face, you can easily adjust your iPod's volume, use track forward or reverse to select your song, and play or pause your music. The digital-gray dial face with its Indiglo night-light offsets the green and silver-tone bezel, and the case, which is made of durable resin, measures 41.5 millimeters. A resin band and buckle clasp ensure a steadfast fit. For further practicality, a day-date-and-month calendar is also included, and the watch can be adjusted for three time zones. Other features include a 50-lap memory, three alarms, a countdown timer, two interval timers, and a chronograph function. This sophisticated timepiece is powered by digital-quartz movement, is water resistant to 330 feet, and is backed by a 1-year manufacturer's warranty.